By Jeff Proctor. When I worked for an ink company, we spent most of every day talking “ink.” And you wouldn’t believe some of the stuff our staff heard on a regular basis-and from seasoned printers at that! So we’ve compiled a list of common “myths” concerning plastisol-perhaps not all of which you subscribe to, but that are astonishingly commonplace nonetheless-and offer a bit of straight-from-the-shoulder commentary in hopes of demystifying each of them. My ink is ready to use, as is, straight from the container! Inks are never ready to use, as is, straight from the container. For one thing, they must always be stirred, both prior to use and before adding any viscosity modifiers. During storage plastisol often develops what is called “false body”-also known as the ink’s resting or static viscosity. Plastisol inks are thixotropic in nature, meaning they will become thinner during movement, such as when stirred or when the squeegee and floodbar push the ink around during the printing process. Frequently, simply stirring the ink reduces its viscosity and saves the printer the cost of the reducer and the time it takes to mix it in. What’s more, if you unnecessarily add reducer and over-thin the ink, stirring would also have saved the cost of throwing out the unusable ink or adding a thickener to get its viscosity back to a printable level. I can get by with one white ink for all my cotton and cotton/poly blends! While this is not totally a myth, there are certainly good arguments that should make every printer think twice about making a single white ink work for both 100 percent cotton and cotton/polyester blends. I visit plants routinely that are trying to use the same white ink on every substrate. Ordinarily, this single ink will be a high-opacity, low-bleed formulation they’ve tested and found to work well on their worst-bleeding fabrics. After all, if the gun works on an elephant it should work on a rabbit, right? Wrong! Ink manufacturers understand fully that printers want to simplify the process. Hey, if they only had one white ink, they’d never grab the bucket formulated for 100 percent cotton and mistakenly print it on a 50/50 garment resulting in a bleeding print and rejection by the customer. However, what printers sometimes fail to appreciate is that ink makers put dye-blocking agents in low-bleed inks to minimize the migration of fugitive textile dyes from polyester-blended garments. However, some textile dyes found in 100 percent cotton garments can come into contact with the blocking agents, and “ghost” images can appear at the point of contact resulting in rejection by the customer. Cost is another reason to add a second white ink to your inventory. Cotton-formulated whites are typically 25-30 percent lower in cost than low-bleed whites. In a competitive world, this can make the difference in securing your bid and protecting your profit margin. A third reason is productivity. If you use a low-bleed white as an underbase, you’ll no doubt encounter longer flash times and higher after-flash tack, both of which will slow down production and cut into your bottom line. And the final reason, folks, is quality. Most plastisols formulated for bleed resistance contain small amounts of the same “blowing agent” found in puff inks. If these inks are overflashed or overcured a slight puffing effect can occur, resulting in a rough print surface. Reducing my high-opacity ink will reduce my opacity! Contrary to popular belief, you can reduce a high-opacity ink without reducing opacity. In fact, you can increase the opacity of such an ink by adding reducer. Because of the components and pigment loads used to give a high-opacity ink this quality, over time the viscosity may get to the point where a reasonable amount of stirring prior to use will not render it any easier to print. Additionally, with designs on black garments requiring finer detail and higher opacity, you will find yourself from time to time utilizing finer mesh counts that could pose a challenge to high-opacity inks completely clearing the screen and stencil. If this is the case, a small amount of curable or balanced reducer (2-5 percent by weight) can be added to the ink to lower its viscosity to a printable level. Depending upon the type of ink and its initial viscosity, a 2-5 percent addition of curable reducer can reduce the viscosity by as much as 20-25 percent, making it easier to print and more prone to clear the mesh. If all the ink clears the mesh and sits up on top of the garment due to this modification, it will actually look more opaque. Be careful to accurately measure the reducer because, in this case, you can quickly get too much of a good thing and cause the ink to penetrate into the garment. I already know how to print, so I don’t need to read a technical-data sheet! Okay, so don’t read it. Print up a few hundred metallic-silver designs, then call us when the customer is screaming at you because that shiny-bright silver ink has “tarnished” and turned an ugly greenish gray after a few washings; or washed off the garment entirely because you forgot that metallics reflect heat and you have to slow the belt speed and increase the heat in your dryer. If you had read the product’s technical-data sheet it would have reminded you about these possibilities, and even suggested an alternate product with a non-tarnishing formula. In this day and age of fax machines, email and the Internet, it should be considered criminal to lack the information to print a job correctly. I print a high-opacity ink over my underbases and on light-colored garments! If you use a high-opacity ink to over-print an underbase-or directly onto lighter-colored garments-you are, again, using an elephant gun to bag a rabbit. High-opacity inks are designed to print directly upon and cover dark backgrounds. You simply do not need that kind of covering power on a white underbase or light-colored garment. 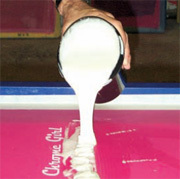 Save yourself some money and increase your production rate by using a less-expensive and brighter ink designed to print on underbases and light-colored garments. I don’t have time to learn new processes or techniques! I frequently listen to customers tell me they don’t want to offer color matching or learn to print high-density because the process looks messy, difficult to learn and they “just don’t have the time.” I guarantee you that a nearby competitor is staying up on the latest and greatest techniques and technologies, and is getting ready to steal your customers away. Award-winning shops continually attend trade shows, vendor open houses and educational seminars and workshops, question their vendors about new processes and products and also schedule time on press to test the processes on their own or with the vendor. One shop with which I’m familiar holds what it calls “training day” at least once a month where the whole shop participates in learning about a new product or process. No time in your busy production schedule? Believe me, the shop to which I refer is (by no coincidence) very busy. It simply schedules this R&D time just as it would any other work. If, after reading this, you still don’t think you need to learn new processes, I hope you’ll call me next time a customer walks into your shop and says: “I’m afraid I can’t do business with you anymore. You’re just too darn good!” But I won’t hold my breath. . . .
Aside from using the best bleed-resistant ink, there’s just nothing I can do to prevent dye migration on 100 percent polyester fabrics! I beg to differ. There are two additional things you can do to increase your chances of eliminating such dye migration: tightly control the temperatures of flash and final cures, and pay closer attention to the fabric you’re printing. During flash curing the platens tend to heat up and will become increasingly hotter during a print run. Adjust your flash-cure units accordingly and make certain you are not over-flashing. Then, when curing the garment, monitor both the fabric temperature and the ink-film temperature to insure the ink film is reaching the manufacturer’s recommended cure temperature with the fabric temperature not exceeding 330°F. Polyester dyes get excited as the temperature rises, and they start looking for a place to go. Most often, where they go is right up through the ink film, causing that beautiful white print to turn a sickly pink within 72 hours or so. A frequently overlooked test for dye migration is simply to check the fabric itself before printing by performing both wet- and dry-crock tests. Take a piece of white cotton fabric, wrap it around your index finger and rub two or three times firmly across the fabric. Inspect the cotton to see if there is any stain from the dyes in the fabric. After this, wet another piece of cotton prior to wrapping around your index finger and repeat the test. Inspect both pieces to see how much dye transferred to the cotton. If you have minimal or no stain at all, you have an excellence chance of eliminating dye migration (provided you do everything else correctly during the print process). If, however, there is a large dye transfer on either of the pieces of cotton, you stand a minimal chance of success and I suggest you take issue with your garment supplier. In fact, I always suggest to anyone printing 100 percent polyester that they order sample garments from different manufacturers, perform thorough testing on each, then offer to their customers only the garments that have the best chance of being printed successfully. I don’t need to run cure tests! Temperature strips/tapes-Placing a temperature strip next to the design as it runs through the dryer has long been a standard in the industry due to low price and ease of use. You get what you pay for, though, as this has been proven to be the least accurate method to measure ink-film temperature. While remarkably accurate in measuring the temperature of a transfer-press platen, temperature tapes have proven significantly less inaccurate in measuring the temperature of a direct print . . . which can lead you blithely toward your next grumpy customer. Temperature “guns”-This is a medium-priced ($100-$150) instrument and currently the tool of choice among printers for measuring ink-film temperature. This instrument is highly accurate-to within ± two percent-if used correctly. The gun is affected by distance, though, so it is important that its laser-dot sighter is aimed directly upon the ink film from no more than six inches away. The measuring point for ink-film temperature should be prior to the print’s clearing the final heat panel in the dryer, in order to know the highest temperature the ink film reached during the curing process. Also, this gun measures only the surface temperature-rather then where ink meets garment-so make certain the surface temperature of the ink film reaches at least 310°F on thin ink deposits and between 320°-325° (at least) on thicker deposits. Temperature probes (on-contact)-Perhaps the most accurate for evaluating your cure-as it actually travels through the dryer, sitting on the garment alongside the print-this is also a very good tool for identifying hot and cold spots within your dryer, or discovering that you have a heat panel that is on the fritz. Unfortunately, as you would expect with a high-quality, precision instrument, it occupies the opposite end of the expense scale from the aforementioned temperature tapes. Wash-testing the garment-Here’s a case where the most straightforward, least sophisticated method is also the most reliable. Simply wash and dry (normally) the test garment three to five times and inspect the print after each cycle. Sometimes printers will cut the design into two pieces and keep an unwashed half as a control against which to evaluate the washed half. If your ink film does not show any deterioration after three to five washings, you have properly cured it adequately. The downside is that this kind of testing is very time consuming. Thus, if it cannot be performed on a daily basis, it should at least be performed at intervals and in conjunction with one of the aforementioned methods of cure-temperature monitoring. For satisfactory results, some form of cure testing should be performed on a daily basis. It’s not always the ink’s fault! On rare occasion an ink will actually fail. However, if an ink that is recommended for a dark shirt fails to live up to its promise of opacity and vibrant color there certainly could be other underlying factors causing the failure. Let us look at all of the factors that control how a light ink will perform on a dark background. Squeegees: Are you using the right durometer squeegee? The higher the durometer the less ink will be pushed through the screen. The angle of the squeegee during the print stroke also makes a difference as a lower angle puts down less ink than a higher angle. Is the blade sharp or dull? A sharp blade will put down less ink than a dull blade. Thus, if you are not satisfied with coverage, try a softer squeegee, with more angle, a duller blade and a slightly slower print stroke. Screen mesh: Are you using the right mesh count for the job? Don’t expect the same results printing a white ink on black using a 160 mesh that you will get with a 110 mesh. Screen tension, off-contact distance, squeegee pressure: Do your screens resemble a trampoline or a wash board? Higher screen tension allows you to set a minimal off-contact distance between your shirt and the screen, enabling you to use less squeegee pressure. Lower squeegee pressure allows the ink lay on top of the garment instead of being pushed into it with excessive pressure. It also increases production rates and decreases fatigue in the manual printer which results in higher profits and employee morale. Emulsion thickness: This is often the most overlooked factor in producing high-opacity prints on dark garments. Your ink deposit is directly related to the stencil thickness on the bottom (print side) of the screen. Depending upon which stencil system you use, it may be necessary to coat your screen the way you are doing now . . . then let it dry and come back with an additional coat on the print side. If you do this, though, don’t forget to recalculate your exposure time, as the additional emulsion thickness will lead to under-exposure. 55 years old Canton, GA Works as Technical Representative for Lancer Group, International manufacturers of Excalibur Inks. Married 26 years. Son, Benjamin, 24 serving as infrantyman in US Army presently in Afghanistan. Daughter, Kate, 19 set to begin her sophomore year at North Georgia College and State University in Dahlonga, GA. My hobbies include backpacking, hiking and mountain biking. My goal in life is to never grow up.